Which below is the most effective anti-aging method? This is an effective Anti-Oxidant with damage correction. Acting synergistic with sunscreens, daily use can reduce the formation of wrinkles, pigmented lesions such as Freckles, and aging of skin texture. Ingredients: Aqua/Water, Dipropylene Glycol, Alcohol Denat., Ascorbic Acid, Butylene Glycol, Triethyl Citrate, Phloretin, Ferulic Acid.. The sun slowly ‘cooks’ the skin cells over 80 years of our lives. We call this oxidization. This process will create wrinkles, pigmented lesions such as freckles, aging texture of skin and loss of elasticity. Obviously sunscreens can prevent this but studies have shown they are rarely used properly. Often 1/10th of the amount that should be used is applied. Antioxidants provides another way to prevent this, simply by sacrificing themselves for oxidization instead of the skin cells. Studies have shown that with regular use of greater than 4-5 days, most types of Vitamin C and E will get saturated on the skin i.e. the skin takes up as much of it as it can take. Antioxidants and sunscreens used together are the basics of skincare. Both are often overlooked. Whatever brand of antioxidants is chosen, they should always be used. Please read the Advanced Comments on SkinCeuticals CE Ferulic first. Compare to that product, this is a newer one, with deletion of Vitamin E, but an addition of Phloretin. What is Phloretin? It is a bioflavonoid found in apple leaves. Research proven, it has 3 functions. A. It can faciliate other substances going into the skin, which is usually a good thing for any skincare products, or to help Vitamin C to get into the skin in this product. B. It has antioxidant effect, which is rather strong. C. It is 'potentially' antiaging (because it inhibit matrix metalloproteinase-1 synthesis in human fibroblast cells which contribute to aging). Remember L-ascorbic acid is known to be unstable. Addition of 0.5% Ferulic acid makes it much more stable. Despite this, it should not be placed under the sun. It may have been better if Vitamin-E was not deleted in this newer product. Daily use can provide synergistic effect with sunscreens for photoprotection. Oxidative process remains the main cause of aging skin, and for those who wants young looking skin even when older, daily use should be started early. 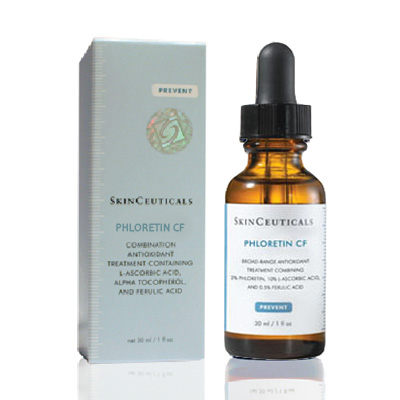 Whether you use CE Ferulic, Phloretin CF, or any other antioxidant, the most important thing is daily use!